Autumn Layers | "Thanksgiving Belly"
Tomorrow's Thanksgiving. Who's excited?! I am! I so long a nice days off to just recharge. I have dinner plan with my friends and pretty much will spend the weekend at home or shopping =p. I was never crazy for black friday shopping but excited with the excitement. Does that even make sense? Here's an outfit idea for Thanksgiving. Since we all know Thanksgiving is a days of giving thanks and most people, including me, celebrate it with food, food and food, it's a great idea for layers. Cover up, what I call, "thanksgiving belly" with layers. lol. Here's another take on "Autumn Layers". Fall is indeed the best time for layers. I get to experiment with different pieces of clothing and I get to mix and match. This idea can turn a simple spring/summer dress to fall-appropriate outfit by adding an outer layer over it. 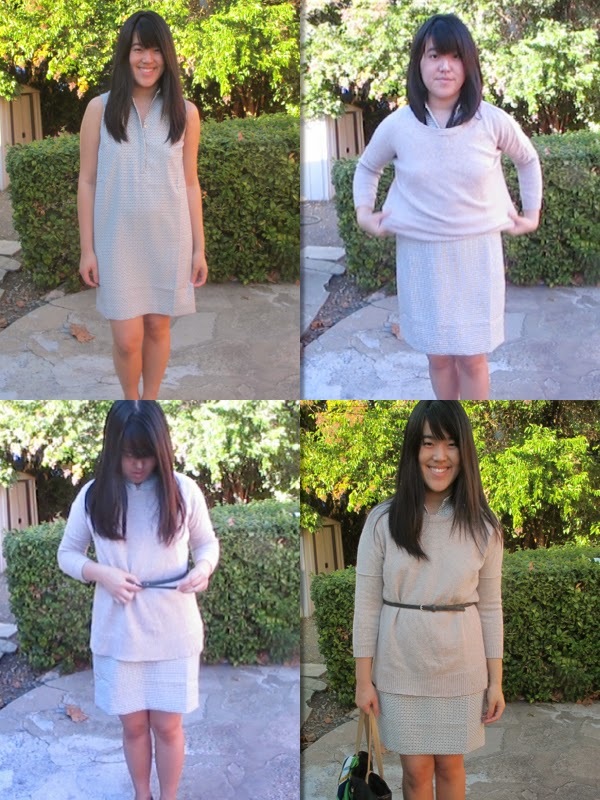 Here I'm adding a basic oatmeal sweater over my sleeveless shirt dress. Adding the sweater creates a whole new look on it. I'm playing it safe with the simple monotone colors, but it will be interesting to layer different color schemes and patterns. That's my first reaction after I tried Dior Pore Minimizer Skin Refining Matter Primer. It's the first primer ever that manages to really keep my T-zone, most oily-prone area of the face, shine free. It works every time. I go out and about, and when I check my forehead, it feels much less oilier than usual. It claims to "instantly corrects imperfections by filling, refining, and mattifying skin for a high-definition flawless complexion". Although the name is "pore minimizer", I'm not so sure how minimizing can pores be. I do see the primer help blur out imperfection and smoothen the skin, prep it for foundation. It leaves the skin feel velvety, and it keeps that way for hours. I've used it for 10 hours straight, and I'm convinced that it's the best primer I've ever used. Don't get me wrong. It won't keep the face oil-free 100%, but close. It helps reduce oiliness and, thus, shininess. Another plus is the packaging comes with a pump which makes it easier and more sanitary. What's the best primer you've tried so far? Fall is the best time for layers. It's getting cooler every week here in San Jose, but it's still warm enough to wear dresses without tights. I wore this dress to my friend's wedding a couple of months ago when the weather was much warmer. I'm trying to create more looks with this dress, and I was inspired by this picture to pair the dress with a basic button-up shirt for something to wear to work. I was so excited when I found out that Hourglass launched their blushes in palette, just like they did with the Ambient lighting palette last year. The individual blush is retail for $35, so the palette is a much better deal for $58, considering. I took advantage of the VIB sale last weekend. Sephora website was down for hours on the first day, so I went to the mall during lunch break to make sure the things I had on my list weren't sold out. This is the only sale I'm looking forward to the whole year, and possibly the only time I really shop at Sephora. Surely enough, there was only one left at the store, so I quickly grabbed it, along with a couple other things. I wish dry shampoo existed at your time. Your hair needs some love too - use conditioner! Lip balm exists, you know. Sunday afternoon is the best time to pamper myself. Face mask, hair mask, body mask, you name it! One of my favorites mask is Honey & Oat 3-in-1 Scrub Mask by The Body Shop. I picked it up several months ago, but didn't really use much of it. My first impression was the scent. It has his rich scent of oatmeal that I find calming. The mask has beads that are oatmeal grains, which should act as scrub. It claims to "cleanse, polish and moisture". The scrub isn't the kind that gets dry. It doesn't dry on the skin, which is great especially for dry skin on this colder weather. I put it on and leave it for about 15-20 minutes, sometimes more while I go about doing something else. Then, I rinse it off with lukewarm water. I read that lukewarm water is better for your skin. I use a washcloth to take it off if I don't go take a shower after. My skin will instantly feel healthier, if that's even possible. It feels not tight, which cold weather does to skin, and smooth. I love this mask. The mixture of honey and oat makes a gentle moisturizing component for the skin. I also like The Body Shop Tea Tree face mask for fighting acne. What's your favorite face mask? My Quincy trip was a low-key/relaxing trip with a lot of time spent outdoors. I didn't pack a lot of stuff in makeup bag, just the essentials, most of which you probably are bored of =). I just wanted to stick with the product I am comfortable with. I do have a couple of new products with me, one of which I have been enjoying for the past month and the other I have been trying out to create different looks with. Last weekend, I had a roadtrip with my friends to Quincy, CA. It was my post-tax-season trip which I seem to have annually. Ocep organized the trip, which I really appreciate. I've never heard of the city before, but Ocep said the Fall color is beautiful there, and it certainly was. I saw the prettiest trees I'd ever seen, and it was just uplifting to see how simple things could bring such and joy and excitement. I'm just happy we went. I hope you enjoy the pictures as much as we did taking them. September has always been a special month for me because it's my birthday month. It's always something to look forward to every year regardless of what I ended up doing on d-day. This September has been such an eventful month full of joy and blessings. I had most of my weekends filled with exciting things. 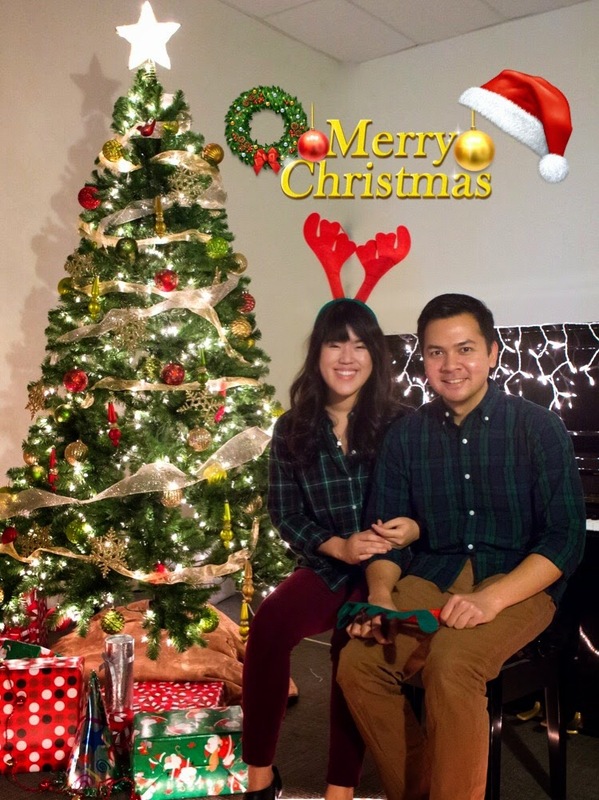 I didn't share as much as I wanted what was going on throughout the month, but let's recap! Finally watched the famous Wicked musical. So glad we decided to spend extra to get a great seat. It was totally worth it! And I'm still in love with the Ann Taylor trench dress. Best purchase of the month! Our impromptu date to Filoli. I posted all about it here. I went ziplining at Mount Hermont. It was fun! You can read more here. My birthday lunch with the girls at work. We had a feast at Mandarin Roots, Palo Alto. The food was really good! My church was having a church dedication since we just purchased a new building. My youth fellowship was in charge of decoration. I am so grateful for this group of people! We had carnival-themed decor with colorful balloons and streamers. The food was delicious. It was exhausting but thank God for the beautiful day! Later that day, my friends surprised me with a belated birthday cake. My boyfriend cooked dinner for us. I was so tired from the carnival event, I didn't even pay attention anything weird going on. He covered it up so well! Our friends' baby girl Sophia was 30-day old! I'm so glad we got to celebrate it with her! Another Friday feast at Sancho's Taqueria. The fried fish taco was da bomb! Our friend got married to his short-time girlfriend. Haha. It was an express courtship, and we were all surprised, but still we pray for the best for him and his wife. I was really looking forward to the wedding just to dress up and hang out. I also managed to do my own hair in less than 10 minutes. Thanks to Kate from The Small Things Blog. She also has a youtube channel with the same name. I tried her 'undone french twist' and it was a success! Seems like weekend always feels so short. Last Sunday, my boyfriend and I visited Filoli in Woodside, CA. He bought a groupon for $20 -for-2-adult entry. The regular entrance is $18 each, so it was quite a bargain. I love going to public gardens. Taking a stroll in the middle of beautiful flowers and plants relaxes me (Check out my visit to other gardens in Mendocino, CA and St. Louis, MO). Lately, my boyfriend also has taken an interest of house plants. He made several cute purchases from our visit.